You can compare the chart of one stock against another. In StockMarketEye, this is called comparison charting. 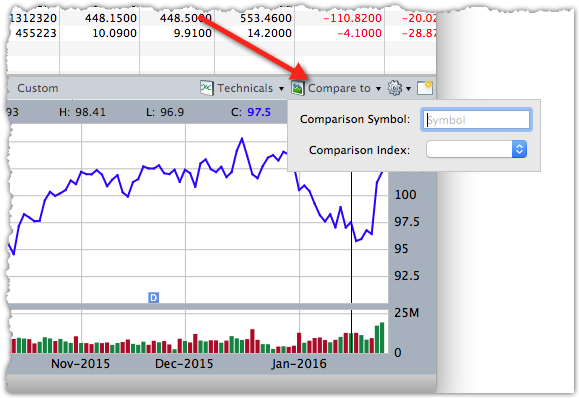 Comparison charting in StockMarketEye consists of adding a “comparison” symbol to the chart. 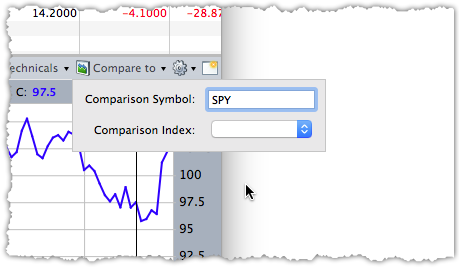 This comparison symbol stays in the chart, just like a technical indicator, even when you switch the main chart symbol. Enter a custom comparison symbol in the “Comparison Symbol” field. You can compare against any symbol, be it a stock, ETF or fund. For example the “SPY” ETF. Or choose from one of the indexes listed in the “Comparison Index” dropdown (click on the down arrow to view the list of indexes). 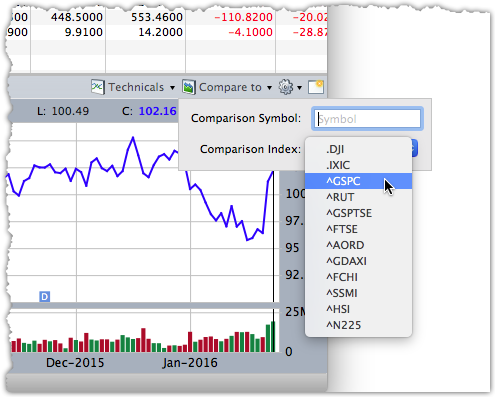 For example, if you wanted to compare against the S&P 500 Index, you would choose the “^GSPC” symbol from the dropdown list. The comparison symbol’s chart will be added. The comparison symbol itself is shown in the upper-left side of the chart. 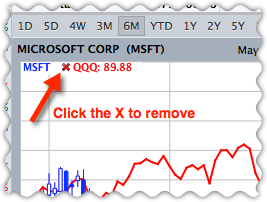 You can remove the comparison symbol from the chart by clicking on the small, red “X” that is just to the left of the comparison symbol in the upper-left portion of the chart.